Who Is Packer Norris Parts? We’re Your Friend in the Parts Business! We Are Solid- Thanks to our dedicated staff and loyal customers, we have grown to become one of the Nation's Largest Distributors of Ford & Lincoln Parts. 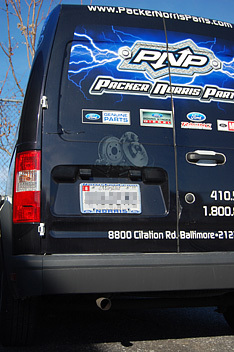 We Are Reputable-Packer Norris Parts is a joint venture between Al Packer’s White Marsh Ford and Norris Ford of Dundalk, two of Baltimore’s most recognized dealerships. This gives us a combined total of over 150 years of experience servicing the parts needs of our customers. We Are Your Partner- Our mission is to form mutually beneficial relationships with our employees, our vendors, and our customers... Relationships based on integrity and the desire to work together to reach both our mutual and individual goals. What Does Packer Norris Do? We’re not just a parts warehouse! We Provide Sales-Our Professional Sales Staff have the knowledge and experience to address your unique parts needs, whether you are a Collision Repair Shop, Fleet or Gov’t Agency, Ford or Lincoln Dealership, Mechanical Repair Shop, or a Ford or Lincoln-Mercury Owner or Enthusiast. We Provide Service-We realize that you have many options available when choosing where to purchase your Ford Parts and Motorcraft Parts. That is why whether you are interacting with a member of our sales team, our administrative staff, our warehouse personnel, or one of our professional delivery drivers, our goal is to exceed your expectations with every Packer Norris Parts Experience. We Provide Support-Our trained staff is available to assist you with any questions that you may have related to Ford Racing Parts, Ford Performance Parts, Genuine Ford Collision Parts, Genuine Ford Maintenance Parts, Genuine Ford Repair Parts, Ford Power Stroke Diesel Parts, Ford Super Duty Parts, and Motorcraft Parts. How Does Packer Norris Do It? Investment-Over $6.5 Million worth of parts In Stock. Community-We continuously look for ways to provide the best overall value and an improved level of service to all of our customers. Competitive-You benefit from our large volume purchasing discounts and incentives - often making us a better value than the aftermarket. Convenient-We accept orders by phone, fax, e-mail, online, or in person at our retail parts store. Our most convenient way to place an order is via our Online Ford Parts Catalog, which provides 24/7 access to over 275,000 Ford & Motorcraft Parts. The catalog can be searched by VIN, Year/Make/Model, or Part Number. You can even view parts diagrams, find related items, see pricing and availability, arrange for pick-up or delivery, and choose your payment method -- all at the click of your mouse.